Build a solid enterprise security foundation. Critical controls from the inventors of file integrity monitoring. Managed security from the cloud. Experience total ICS intelligence at your fingertips. Get the best family of cybersecurity solutions with Tripwire. Automate IT regulatory compliance quickly and easily with Tripwire. Industry-leading cybersecurity for the modern enterprise. Protect against cyberattacks with the industry’s best foundational security controls. Detect threats, identify vulnerabilities, and harden configurations in real time with Tripwire. What is a GOLDENDOODLE Attack? Build a solid cyber security foundation with Tripwire Enterprise. Real-time change intelligence with the industry-leading threat detection software. 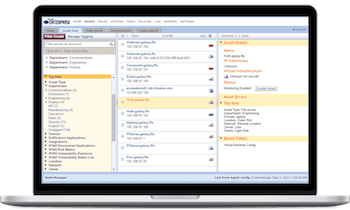 Know what's on your network with our complete Vulnerability Management solution. Learn how Tripwire outperforms other cybersecurity solutions. Get Tripwire as a service and professional administration in a single subscription. Discover our all-in-one security solutions for teams that move quickly. Focus on events of interest in a sea of data using complete, secure and reliable log collection. 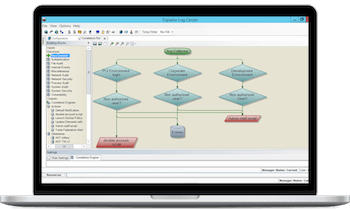 Quickly customize collection and filtering rules using a Visio-like drag & drop interface. Tripwire’s industry-leading FIM detects changes on assets across your enterprise, from on-premise data center to public cloud, and remediate them to a known and trusted state. Know who changed your systems with Tripwire Enterprise FIM. 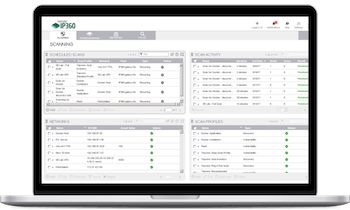 Discover and profile all assets on your network with Tripwire IP360. Minimize manual effort through integration with your existing tools and processes. Get complete asset discovery with Tripwire’s easy system remediation. Reduce audit workload by leveraging the most extensive policy library in the industry. Automate workflows to achieve and maintain compliance over time with monitoring, audit evidence and reports. Detect, audit and validate changes across your network to flag unauthorized changes for investigation, reduce unplanned work and speed up MTTR when incidents occur. Have you ever wished your FIM and VM solutions could talk to each other? Join Tripwire product expert Rod Musser on Tuesday, May 21st at 10 a.m. PT for our first ever webcast on the benefits of VM-FIM integration. Get up to speed with the most granular risk scores and lowest false positive rates on the market in a quick intro to Tripwire® IP360™. Please visit our Events page to see where Tripwire will be next. By understanding and facilitating the cultural shift that DevOps requires, you can help your team work faster and more securely, with sustainable results. Download this eBook to learn everything you need to know to start running DevOps securely at scale. Cyberthreats are constantly evolving. Visualize the current security status of your IT environment by adding Tripwire’s deep configuration and change data with IT information stored in Splunk Enterprise. In this blog, we examine a particular method for evading detection that's often used in conjunction with maintaining persistence: hiding within the Windows registry. Explore our industry-leading product family or get in touch with us for a free product demo today.